Type 2 diabetes is the the most common type of diabetes. If you have type to diabetes you suffer from insulin resistance, which means your body is not properly using insulin. In addition to having insulin resistance many diabetics also struggle with high cholesterol and obesity. It has been well established that exercise can help ease many of the issue that arise from being a diabetic. This might be especially true for strength training. Several medical research studies have noted that strength training can improve a type 2 diabetics health. In fact some of the medical conditions that put Diabetics at risk for complications can be mitigated by regular strength training. Strength training has been shown to increase insulin sensitivity in type 2 diabetics. Several studies have found that diabetics who adopt a regular strength training program improve their Hemoglobin A1c test results. Regular progressive strength training will increase the amount of muscle you have on your body and it might enhance your muscles ability to manage glucose. Researchers believe that increased insulin sensitivity can be attributed to these two changes . Type 2 diabetics can reduce their bad cholesterol (LDL cholesterol ) by participating in a strength training program. A study published in 1997 reported that 5 months of progressive circuit resistance training significantly lowered LDL cholesterol and reduced fasting triglycerides in type 2 diabetics. The presence of excessive belly fat has been link to type 2 diabetes. Fortunately type 2 diabetics can reduce their belly fat by adding strength training to their fitness program. A 2004 study found that type 2 diabetic men who strength trained twice a week reduced their visceral and subcutaneous abdominal fat by 10.3 and 11.2%, respectively, and increased their insulin sensitivity by 46.3%. Strength training sessions should be conducted three times a week with rest in between each session. Trainees should select a variety of exercises that will work all the major muscle groups. Each exercise should be preformed for 3 sets of 8 to 10 repitions. Trainees should select a weight that is heavy enough to make it difficult to perform, in good form, the last repetition of a set. Once an exercise becomes easy to preform for 8-10 repetitions, the resistance level should be increased or a more challenging exercise should be selected. Strength training allows diabetics take an active role in safeguarding their health. This powerful tool in the fight against type 2 diabetes is widely available and cost effective. 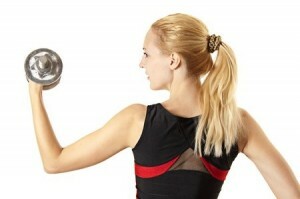 Take your health into your own hands today and start a strength training program.